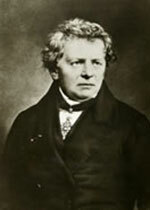 Ohm was only 16 when he began studying mathematics, physics and philosophy at FAU, where he completed his doctoral degree in 1811. He was mainly interested in the field of electricity, which was still largely unresearched at this time. His discoveries include Ohm’s law, Ohm’s torsion balance, a device used to measure current, and Ohm’s acoustic law, all of which were named after him. In 1841, he was awarded the Copley Medal by the Royal Society in London, an accolade which held the same prestige as a Nobel Prize today. However, his greatest honour came after his death when, in 1893, at the International Electrical Conference in Chicago the name Ohm was given to the international unit of electrical resistance, which is depicted by Greek letter omega.